The CEO of the Port Authority of Piraeus, Captain Fu Chengqiu, and the President of the North Adriatic Sea Port Authority, Pino Musolino, during a meeting held at the PPA headquarters, yesterday signed an MoU aimed at strengthening relations and cargo flows between the two ports. The two parties have committed themselves to establishing a stable and mutual cooperation, in order to develop their ports and port services, supporting infrastructural connectivity policies and port services aimed at fostering the commercial flows between Europe, the Mediterranean and the Far East via the two ports. The memorandum also aims at improving the exchange of best practices and know-how in port management, specifically in the fields of information technology, investment attraction and communication. The common target is to improve the performance of the two ports, which serve as fundamental networks in the upcoming international maritime connections along the new Silk Road. Pino Musolino, President of the North Adriatic Sea Port Authority (Ports of Venice and Chioggia), declared: "In an upcoming scenario which foresees a powerful increase of trades between Asia and Europe along the new maritime Silk Road, it is necessary to put all our efforts on the rationalisation of the logistics chains, starting from the ports and from the road connections with the inner markets, in order to shorten distances, to lower transports costs, to remove trucks from roads and improve the environmental sustainability of trades. Venice - the westernmost point of arrival by sea in the Chinese strategy of the Belt and Road Initiative - has long been sharing this goal, working day-in and day-out with private and public operators in order to give substance and reliability to the commercial flows between Europe, the Mediterranean and the Far East. 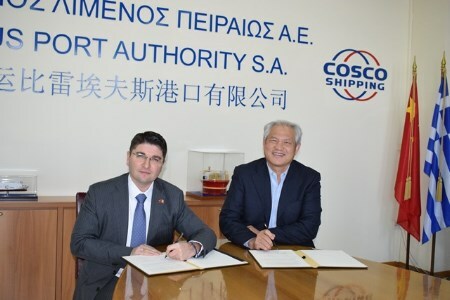 Through this agreement, which is coupled with the other recently signed with COSCO SHIPPING for a weekly connection Piraeus-Venice, we want to clearly show that the development of trades primarily requires commercial agreements, optimisation of services and targeted infrastructure interventions. This is the right path to create value for our economy and for our territory."